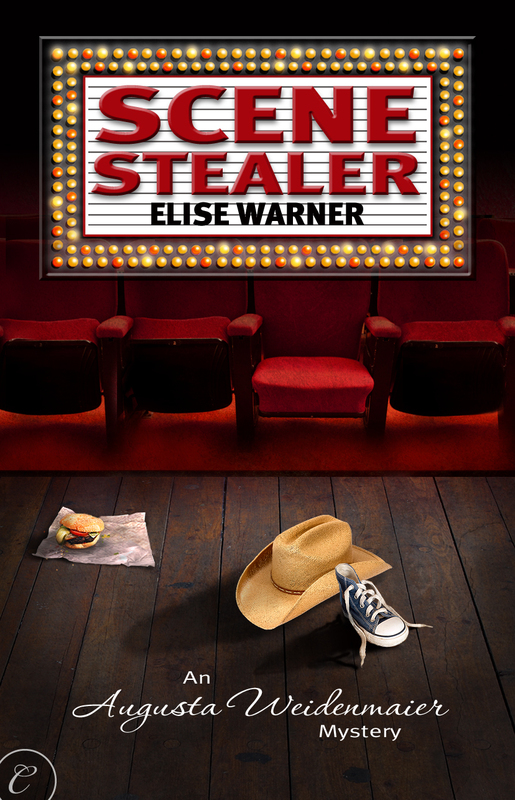 Scene Stealer – Elise Warner Posted in Cozy, New York on August 4, 2010 Before Elise Warner started her writing career you could find her on Broadway, working with National Companies and in clubs as an actress, singer and stage manager. She has even written a play which won Theatre Guinevere’s “Guinny Award”. After that she started writing for various magazines but this is her first novel. Scene Stealer features Miss Augusta Weidenmaier, a retired school teacher who is caught up on the case of a kidnapped child, an actor in fact, and feels that she must help the police solve this crime. She does this putting her self in harms way a time or two, and as expected of a school teacher, a rap or two on the knuckles of some not some helpful characters. When I first started reading this book I wasn’t sure what to expect, in fact, I wasn’t even aware that this was the author’s first novel. The story started off with Augusta noticing a child on the bus and as a former schoolteacher knew that something wasn’t quite right. The child looked scared and the man he was with was a bit scary himself. She departs the bus to try and follow the pair to see if she can help the child. In the back of her mind she recognizes the child but does not realize he is an actor for a local fast food chain until his disappearance is publicized in the media. Then she realizes what she saw could help find Kevin and bring him back to his mother. She doesn’t realize the danger that she ends up putting herself in to until it is too late. I was beginning to wonder why someone would want to read this book if the kidnapper was going to be revealed so early in the book. But imagine mysurprise when the obvious wasn’t as obvious as you might think. It was a nice twist that I wasn’t expecting and pulled me back in to the story wondering how it was going to end. I give this book 3 1/2 stars and if the author decides to make this a series, I will definitely check out the second installment. This entry was posted on August 5, 2010 at 3:35 pm and is filed under authors, New Yorkers, Uncategorized, writers. You can follow any responses to this entry through the RSS 2.0 feed. You can leave a response, or trackback from your own site.